This is a full length soft silk chiffon dress with vintage inspired applique and a satin pleated belt. 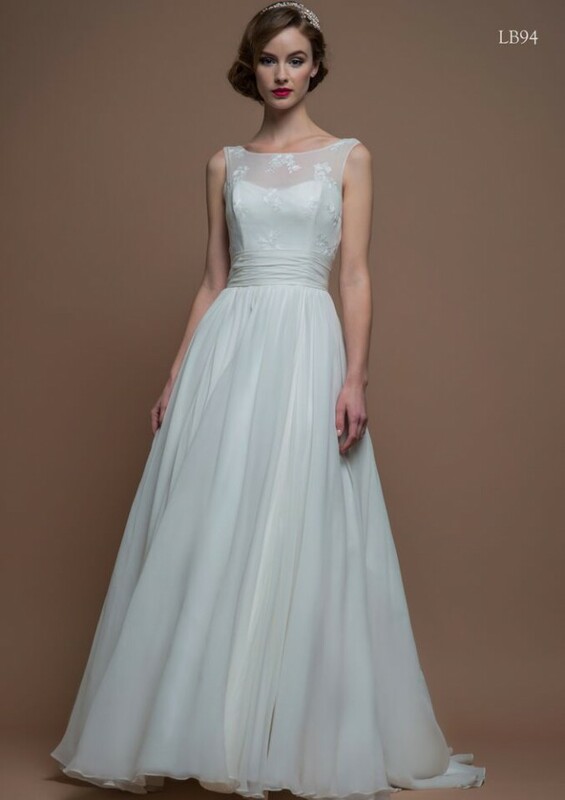 It is by British designer Loulou Bridal, known for the beautiful vintage inspired styles. I purchased this as a sample gown last year planning to wear it for my wedding, but decided to go with another dress. The size is 16UK, or 12 US, but this is sample size for wedding dresses and will fit about one size lower (14 UK or 10 US). There have been no alterations and I see no flaws in the gown. It has been stored for the last year, so will likely need a pressing, but is otherwise clean and ready to go. Once you send a message, Betsy can invite you to purchase the dress.